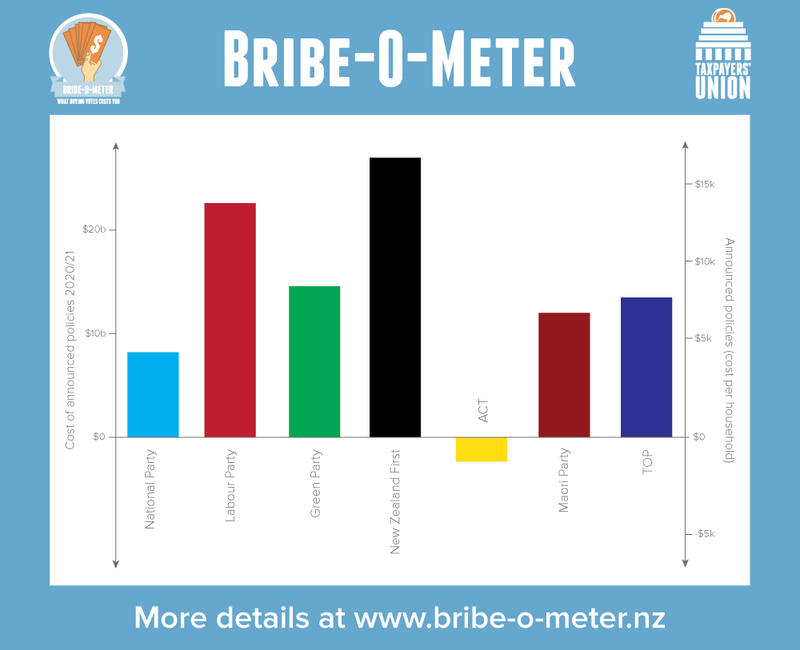 In the final Bribe-O-Meter update before the election, the Taxpayers’ Union has put together the combined manifesto costings for a range of potential coalitions. These figures will allow voters to gain a better understanding of the fiscal implications of a potential Government over the next three-year parliamentary term. This week we have put together all the likely coalition options so that voters have a better idea of what their vote might cost taxpayers. While the coalition totals account for crossovers in policy (so there is no double counting), the figures assume that each party spends what it has promised. It does not take into account possible changes arising from negotiations to form a government. A National-ACT coalition has promised the lowest new spending, combining for a total of $5.9 billion, or $3,441 per household. National has promised $8.3 billion, and ACT a net-reduction in spending of $2.4 billion over three years. ACT, National and the Maori Party have promised a combined $18.1 billion, or $10,501 per household. However, 67 percent of this total spending is from the Maori Party alone. A Labour-Green coalition has promised $35.2 billion in new and unique spending, equivalent to $20,397 per household. There is considerable crossover in Labour-Green policies, which has been accounted for. National and New Zealand First have promised a total of $35.8 billion, or $20,788 per household. 77 percent of this spending is from New Zealand First. Labour and New Zealand First have promised $49.6 billion, or $28,744 per household. The Labour-New Zealand First total is made up of 46 percent of Labour Party spending, and 54 percent New Zealand First. A Labour-Green-New Zealand First coalition has promised $61.7 billion, or $35,787 per household. 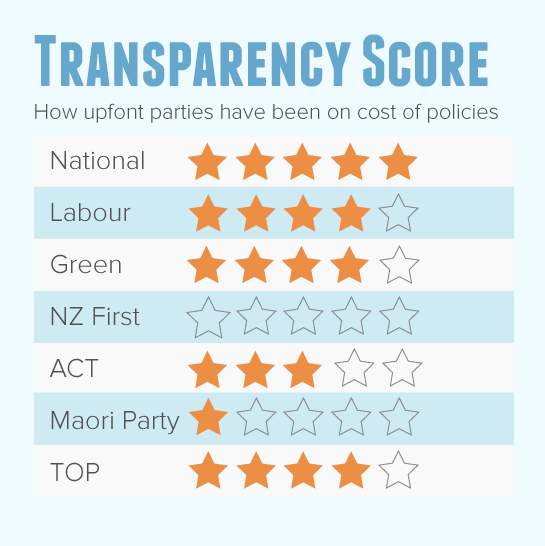 This comprises 37 percent Labour Party spending, 20 percent Green Party spending and 43 percent New Zealand First. Note that the coalition totals account for crossovers in policy (so they do not necessarily match the sum of the individual party figures listed above).